In one of the late games on Friday night – the #7 Michigan State Spartans play the #3 Oklahoma Sooners in the East region semifinal. This game has the lowest point spread on Friday. I knew the Spartans would be a force during March Madness after watching them play Wisconsin in the Big Ten Championship. MSU have beat Georgia (70-63) and Virginia (60-54). Oklahoma beat Albany (69-60) in round two and Dayton (72-66) in round three. Dayton was playing good basketball, but I still don’t think the Sooners have really been tested in the tourney yet. Still a need a place to bet on March Madness online? BetOnline is one of our highest rated bookies and they accept bettors from practically every country, plus they start you off with a $1000 bonus. MSU vs. OU Odds – Where’s the Action? 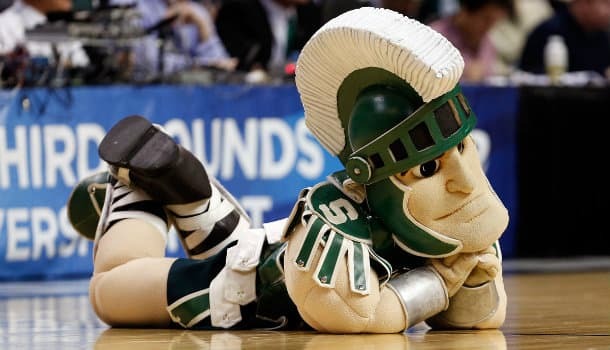 The Spartans are only a –1.5 point favorite and priced at –130 on the money line, while the Sooners are +110 on the ML. Close to 80% of ML bets are on MSU and 62% of point spread bets are on them too. The over/under opened up at 133.5 points and has been bet up to 135.5 points already. However, the action has been split on the game total. 54% of the bets have been on the over. This is going to be a close game. These two teams match-up very similarly on paper. MSU averages 71.9 PPG (65th) on offense, 37.7 RPG (36th), 17.1 APG (4th), 4.6 BPG (51st) and 5.3 SPG (283rd). Oklahoma averages 71.9 PPG (65th), 38.1 RPG (23rd), 12.5 APG (182nd), 5.0 BPG (23rd) and 6.9 SPG 91st). On defense the Spartans are giving up 63.1 PPG (85th), while the Sooners are allowing 62.8 PPG (74th). Travis Trice has been the best player for MSU and he has March Madness experience. Trice comes into this game averaging 19.0 PPG, 2.5 RPG and 4.5 APG so far in the tournament. Branden Dawson has been impressive as well down the stretch this season for MSU and his good play has continued in the tourney. He’s averaging 14.5 PPG, 7.5 RPG and 3.0 BPG through two games. Oklahoma gets productions from everywhere and when one player is struggling another one seems to step up in his place. Every starter is averaging 7.5 PPG or more in the tournament so far. Ryan Spangler is only scoring 7.5 PPG for the Sooners, but he leads the team in rebounds with 11.5 RPG in the tourney. He’ll need to come up big against the Spartans tough interior offense. TeShawn Thomas is averaging 13.5 PPG and 7.0 RPG, plus Frank Booker is coming off the bench and scoring 10.0 PPG in the tourney. This Sooners team is tough to defend because everyone scores. Tom Izzo is one of the best college coaches in the game and his experience at getting his players ready for these types of games will be the difference in a game between two very similar teams. Denzel Valentine is another experienced player on the Spartans that can take over a game at any time with his skill set. Oklahoma is a bit deeper, but the Spartans have the best players on the court. This game will likely come down to the wire, but that’s where the Spartans experience will shine. They don’t have to win by much at all and I’m surprised we haven’t seen more bets on MSU yet.